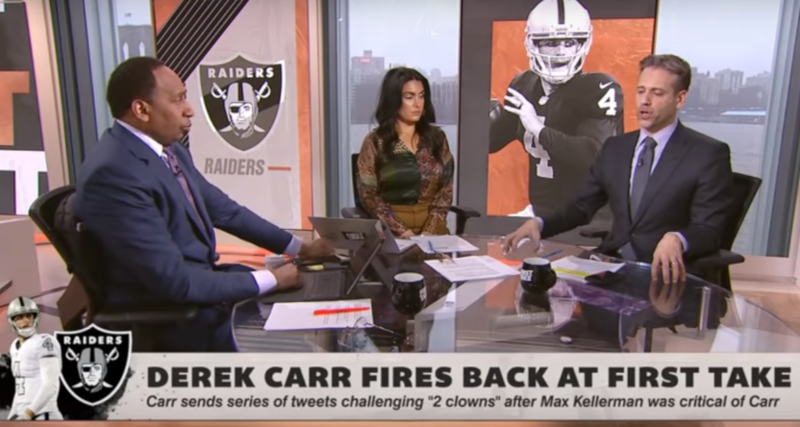 Derek Carr asks Dana White to set up a fight against "clowns on TV"
But the particular way Carr responded here wasn’t necessarily the best look, and “I can beat you up” certainly doesn’t prove anything. And beyond that, his response only provided more fodder for Kellerman and Smith’s hot takery, whereas just ignoring this probably would have ended its news cycle. But while it won’t ever happen, it certainly would be amusing to see Stephen A. or Kellerman get in a ring or an octagon with one of the players they criticize so casually, and it would definitely sell a lot of PPV buys. At the very least, that might make them think a little more before implying that an athlete “didn’t want it.” It seems more likely that this won’t change anything for them, though; getting an athlete to respond to their hot take bait just gets them more attention, and more things that they can talk about on the next show.